Hey lovelies, how are you all doing? Whether you're still in school or not anymore, I'm sure all of you can remember the stress of 'Exam Season' and that's exactly what I've been going through this week too. 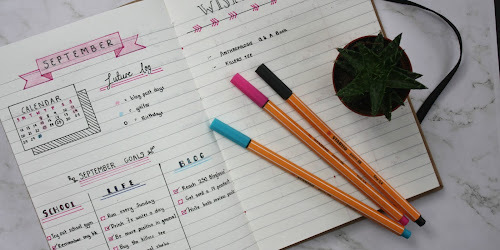 Although I'm only taking my Year 10 Mocks, the amount of work I've had to set myself this half term has been crazy and while I've done a couple of revision posts on my blog - this week really took it to a whole other level. I've planned out timetables, made hundreds of different flash cards and smothered everything with pastel highlighters... and guess what, I'm will still always feel under-prepared! 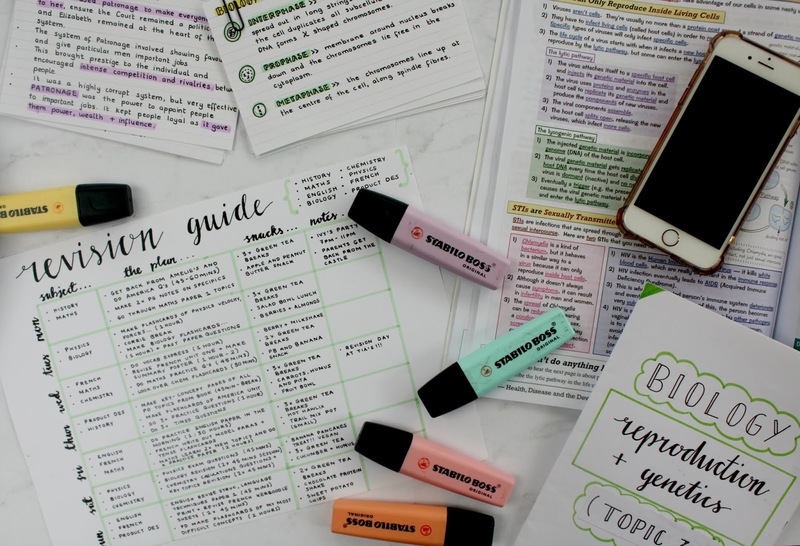 Anyway, in this post I thought I'd share with you a few helpful and realistic tips for managing your revision, as well as some inspo pics of how I take my notes and keep myself organised. Since I know many of you are in the same boat as me right now, whether it be mocks, GCSE exams or A-Levels, hope you find this useful. 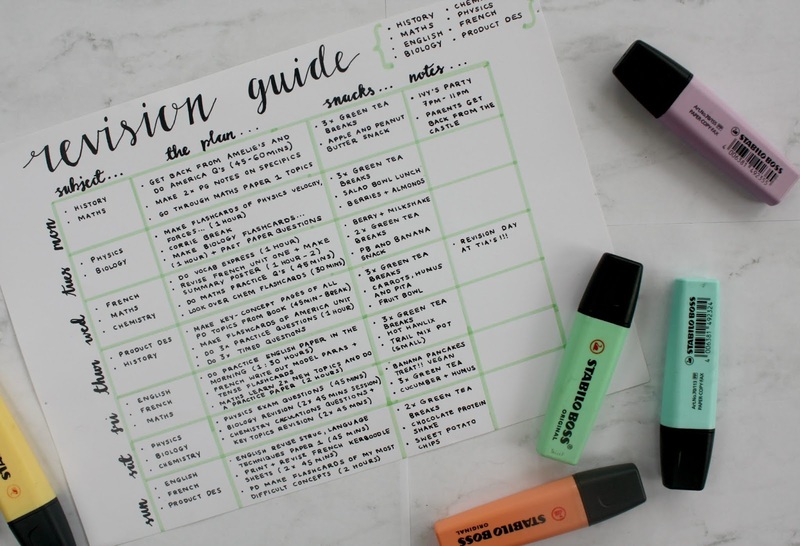 The first thing I'd recommend is planning out a timetable and structuring your revision. It's all well and good saying you'll revise for 'X' hours a day but if you don't plan it out properly you're unlikely to actually get any of it done. You all know how I love my aesthetic spreads and bullet journal style so I went all out on my revision timetable (mainly as procrastination oops) but as you can see from the first picture I made sure to include: the subjects I wanted to revise that day, the plan (eg. do maths practice paper one, then make flashcards for biology) and then other notes from that day. This is one I constantly have to remind myself to do but it's so important, otherwise you'll be burnt-out before you know it and it will make it so much harder to revise for the rest of the day. For me, I find 45min work - 15 min break intervals work best for me but if you're someone who find it harder to concentrate of course adapt it to you. Do something to help you relax in the breaks, like make a tea, watch some tv, or go for a wal. Only now I'm realising how useful this is. 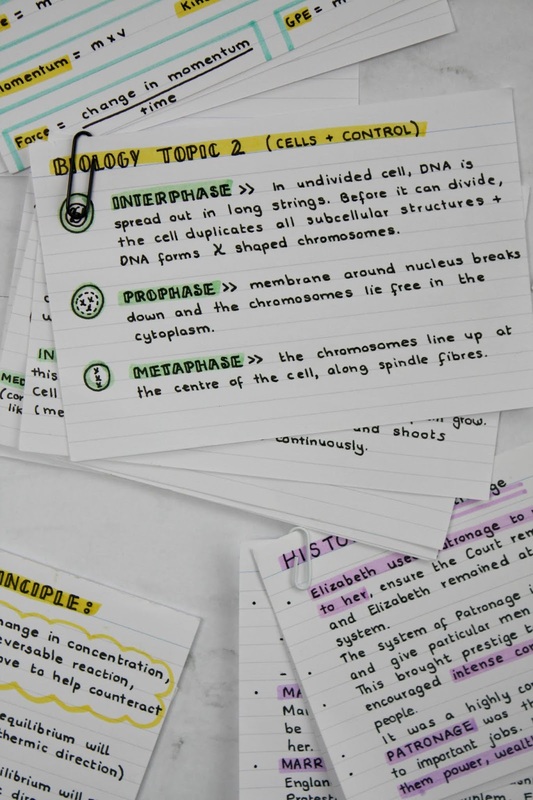 Making flashcards along the way even before it hits exam season now means I have tons of notes to revise from now and don't have to spend hours making them. I currently have a little stack of flashcards for each subject now so by the time I actually get to my GCSE's in year 11 I'll have some for every topic to learn from. Revision can be so draining and I'm sure you feel that! Make sure to reward yourself for a hard day, whether that be with food (*cough* my fav) or a chilled bath and relaxation. Recharge, rest and it will make coming back to revision a lot easier when you do instead of over-working yourself. In terms of actual revision techniques, this is my all time favourite. As you can see from the pictures above I always make revision booklets on certain topics and essentially for me it's like re-writing the text book in my own words. 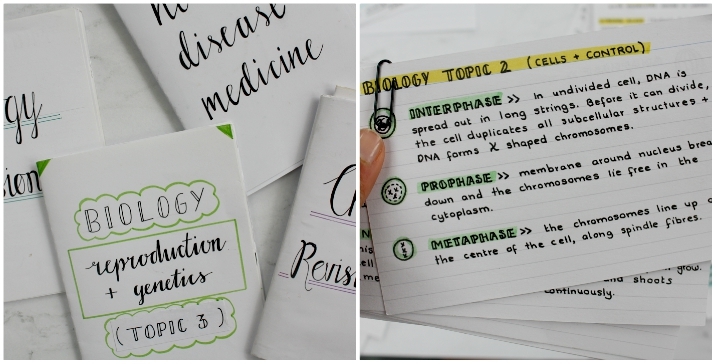 All you need is some plain white card, some pens and highlighters and you can start compiling all the information together. 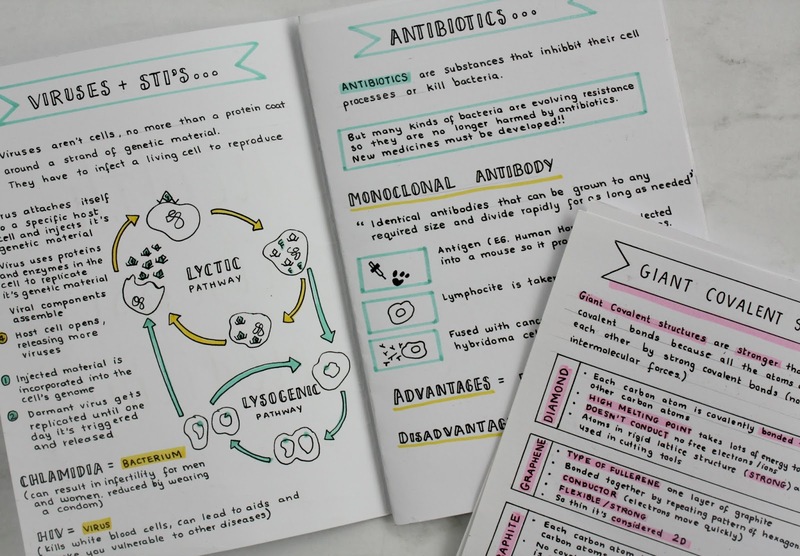 Like in the picture, you can see my booklet for biology on Health, Disease and Medicine where I copied out diagrams and key topics in the unit all into one handy little book. 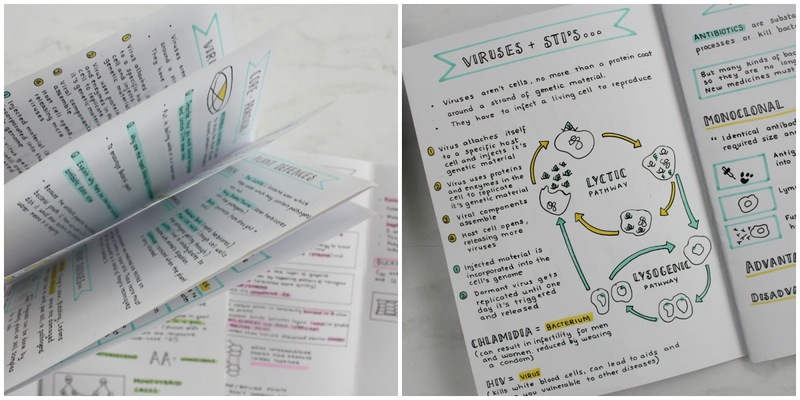 And before you know it you'll have a stack of these for each subject ready to revise from! There are two types of people when it comes to revision: the ones that pretend they've done tons of revision already and have been prepared for weeks, and the ones that make out like they've done no revision at all and aren't bothered at all. But the most important thing for you is to ignore all of this. You know how you're doing, and don't let yourself get stressed over other people and comparing yourself. I kept having to remind myself to do this, this week, but switching up your location can really help with keeping you focused and motivated in revision. Spending hours sitting at your desk is not great for your mind and your body too, so I would definitely recommend moving your revision about to cafes, the garden, a different room. So even if you have to be revising, you don't end up an anti-social mess for that week. 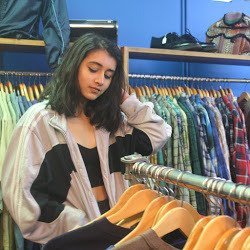 Let me know if you found this post helpful, and ahh hopefully I've learnt from all these tips too and will do okay in my GCSE Mocks next week. 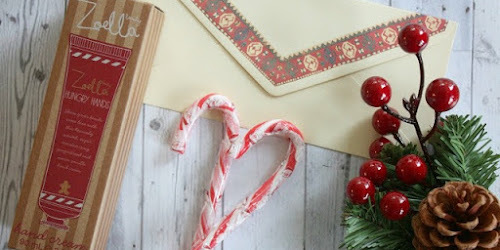 It's a vv stressful time of year but me and the rest of the community are always here to chat and ramble about school-related problems, so drop me a comment in the comments section below if you ever need to. Good Luck everyone and I'll speak to you soon. QOTD: WHAT REVISION TECHNIQUE WORKS BEST FOR YOU? These are great tips! I’m only in Year 9 so I have a while to go before I do my GCSEs but you can never be to prepared :) Anyway, good luck on your mocks! I've already completed my GCSEs but I'm sure people who are sitting them at the moment will find this really helpful. I love how pretty your notes are! 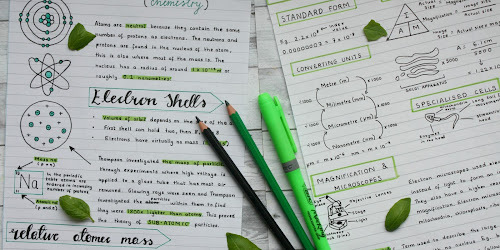 I've been out of school for a while but I love how you planned out your notes and cheat sheets! The penmanship is ON POINT! Thanks for sharing these tips and good luck with the mocks! I certainly don't miss revision! Good luck though- you'll do great!! 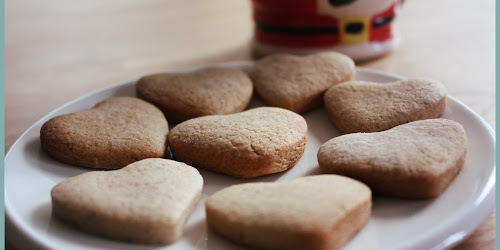 These are fantastic tips! Sounds like you're really well-organised! Oh wow, these notes are absolutely gorgeous! I've just finished my final exams and I have to say, changing your location is incredibly useful when it comes to freshening up and reopening your mind. I don't think I would have gotten nearly as much done staying at my desk! Wow I'm no longer in school but these are very pretty and organised!! Great tips here especially about taking breaks. Great tips hun! I'm in uni but these tips will be useful even for my uni exams! I hope your mocks went well.